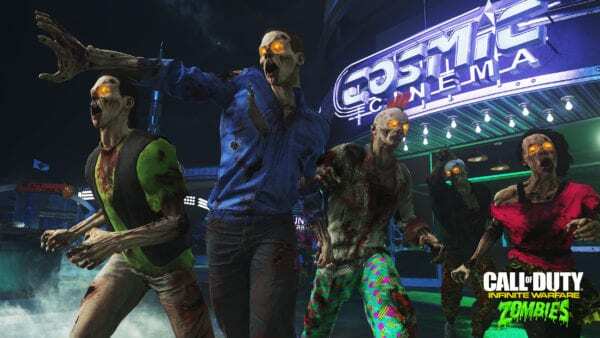 Before starting a new round of Zombies in Spaceland in Call of Duty: Infinite Warfare, remember to take a quick look at your loadout. Not only can you check out the game’s available weapons here, you can also organize your Fate and Fortune cards, and build a deck that will help you out in the mode. 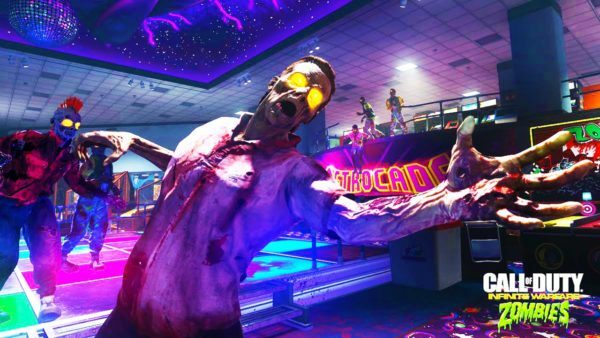 There are cards that replenish your grenades over time, and other neat abilities that allow you to call in weapon drops, increase your ammo drops, and boost your fighting damage against the zombies. You’ll only have access to a few cards when you’re first starting out, but take this time to familiarize yourself with them, and you’ll unlock even more cards as you continue playing. 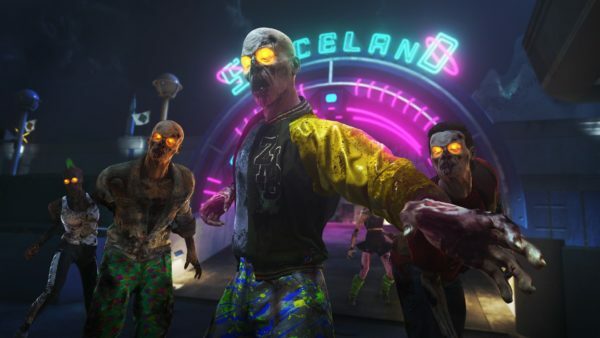 During the first two rounds of Zombies in Spaceland, the enemies can be taken out with one or two melee attacks. I highly recommend using your melee attacks as much as possible during this time to conserve ammo. The ammo drops are extremely low, and you’ll definitely want to conserve your bullets and save them for later rounds when things get a lot tougher. If you do happen to run out of ammo, don’t hesitate to purchase a new weapon, unless you have a card ability that will summon in another one for you. Also, don’t forget to board up the entry points after the zombies break in. While it can take some time (though certain cards will speed up this process), boarding up the windows will earn you more points that go towards your level. This is a big tip for solo players. If you happen to be playing alone, it’s often wise to drop $500 on the Up’N Atom item as soon as you can. 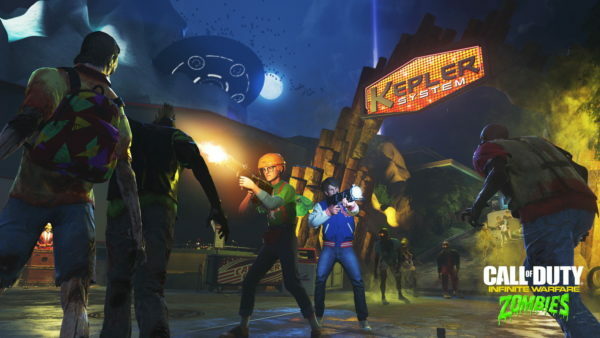 While the perk only allows you to revive other players quicker when you’re in a multiplayer game, it will work as a self-revive if you’re on your own. You probably won’t use it during the early rounds, but this perk could potentially turn into a lifesaver once you start heading into the more challenging ones. You can always get more money through killing zombies. Every once in a while, a random zombie will drop a Souvenir Coin, which you can then use on the souvenir machine to get items. The catch is, you need three Souvenir Coins in order to get an item, and you can only carry one at a time. Once you’ve found a machine, make a mental note of its location, and go to it whenever you pick up a Souvenir Coin. The idea here is that you should try to get rid of your Coin as soon as possible so you can min-max your foray in the theme park, and have an empty Coin slot the next time a zombie happens to drop one. In between rounds, you’ll get the chance to take part in a Clown Wave, where a horde of clowns will rush towards you. Yes, it’s as terrifying as it sounds. However, the Clown Waves are actually a means for you to stock up on ammo before the next official round begins. 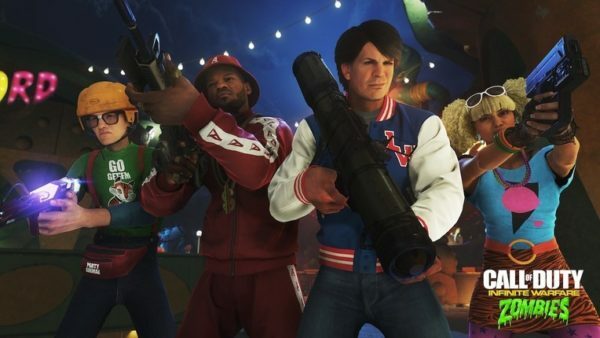 The Clown Waves will occur in between every five rounds, and if you can survive them, your ammo capacity for your weapons and grenades will be refilled. Considering the scarcity of ammo in this mode, the Clown Waves are an invaluable way of keeping yourself topped up.